Find the beach break 'Playa Norte' in Punta Hermosa (43km south of Lima) and paddle out to the really obvious break (700m paddle) - or go in at Senoritas and do an equal length paddle. Or take a jet-ski! English (Traduisez ce texte en Français): Find the beach break 'Playa Norte' in Punta Hermosa (43km south of Lima) and paddle out to the really obvious break (700m paddle) - or go in at Senoritas and do an equal length paddle. Or take a jet-ski! 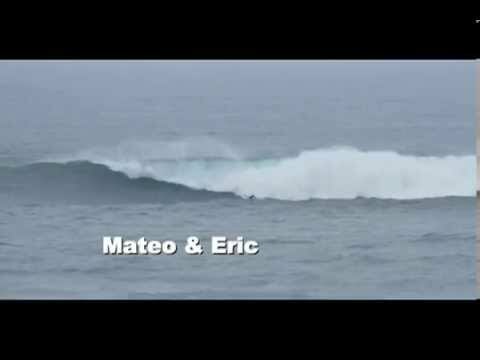 This is one of the biggest waves in South America - holding waves upto 24 feet - bring a Gun in the 9-10 feet range. It draws big wave riders from all over the world and has recently seen tow-in surfing. The wave only works when the swell is big and everywhere else is closing out. Tides are relatively unimportant - if the swell is big enough, then it will work. To add to the fun - the distance from shore makes getting positioned (and staying in position) really hard. Being in the wrong place is bad. The big pacific swells which rock in tend to have big long sets (15-20 waves / set), which means timing and placement are really important. Big, powerful and frightening. The only consolation is that the break is a long way out and you are unlikely to hit the bottom. However with half the pacific ocean on your head this probably won't be your main preocupation. English (Traduisez ce texte en Français): A destination in itself for those who like this kind of pleasure. It is in a formidable position with heaps of quality spots within a few kilometers...<br />Awesome! English (Traduisez ce texte en Français): A destination in itself for those who like this kind of pleasure. It is in a formidable position with heaps of quality spots within a few kilometers...&lt;br &#47;&gt;Awesome! English (Traduisez ce texte en Français): A destination in itself for those who like this kind of pleasure. It is in a formidable position with heaps of quality spots within a few kilometers...&amp;lt;br &amp;#47;&amp;gt;Awesome! Wrong Luzbelito - I don't know what luzbelito is talking about but even my 5 year old niece can ride santos, I've been around and to me (personal opinion) Pico is the baddest,ah, and I'm mexican. Santos - Santos is the biggest (of them 3). Pico is prolly the smallest, whcih is not bad considering the other two are mosnters. peruvians will tell you Pico is the biggest thou.